Burglary is entry into a building for the purpose for committing theft. The key element is theft from a locale rather than a person. Compare with Robbery below. The standard punishments are fines and time in the stocks or pillory. Repeat offenders or those committing grand theft may be branded as outlaws. Fraud is lying in a written document. The document could be a signed agreement or penned under the author's name. Fraud has to be in writing so oral lies do not constitute fraud and are technically not against the law, with the exception of perjury (see below). A common challenge to a tall tale is "to put that in writing." 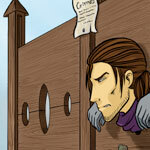 The standard punishments are a fine and time in the stocks. Indentured servitude is possible if the fraud is severe enough. In Aradie, as in Saronne, it is unlawful to practice a trade without being part of a guild. The guilds stringently enforce their right to a monopoly in a particular field of industry and bring claims against anyone violating their letters patent. The standard punishments are fines, seizure of goods, and indentured servitude. Perjury is the crime of lying to a official of the Crown, such as a judge, inquisitor, or gendarme. Normally, lies are not an enforceable action unless written (see Fraud above), but the Crown requires all its subjects to be truthful to its representatives. The standard punishments are fines, time in the stocks or pillory, or flogging. Pick Pocketing is theft from a person using legerdemain or distraction. It relies on deft movement and ignorance of the victim and does not involve violence or threat of violence. Compare with Robbery. The standard punishments are fines and time into stocks or pillory. Robbery is theft from a person using violence or threat of violence. The item or items stolen need not be on the victim’s person, but under his or her immediate control. Compare with Burglary and Pickpocketing above. The standard punishments are fines and time in the stocks or pillory. Robbery is a crime of property. Any actual violence committed during the robbery constitutes a separate crime. Slander is lying to discredit another individual. It is not a crime in Saronne and its colonies unless it constitutes fraud, perjury, or sedition. While the Crown will not abide any insult to its reputation, it does not enforce the same respect to its subjects. The subjects may take matters into their own hands and deal with slanderers themselves. Smuggling is the unlawful transport of goods. Most commonly, smuggling involves importing without paying fees. However, the colonial government restricts the import and export of certain goods within Aradie and smugglers circumvent these restrictions. The two primary restricted goods are furs and brandy. Furs because the Governor General wishes to stabilize their supply and thereby their price. Brandy because of the effect it has on the native allies of the colony. The standard punishments are fines, time in the stocks or pillory, the seizure of all smuggled goods, and the revocation of any permits to participate in the fur trade. Tax Evasion is the avoidance of paying taxes. The colonial government has a number of taxes, mostly on real property, but occasionally there is a head tax to pay for certain civic improvements. Tax evasion is seen as a more serious crime than smuggling. The standard punishments are hefty fines, seizure of property, and, in extreme cases, indentured servitude. A host of punishments await those who break the law in Aradie. If a criminal is a threat to the colony and too dangerous to be released as an outlaw, the colonial government will execute the offender. The most common form of capital punishment is death by hanging (stretched in the joual of Sherbourg). Fines are the favorite form of punishment in Aradie as it enriches the coffers of the colony while being fairly inexpensive to implement. Many settlers came to the colony to seek their fortune, and a fine hits them where it hurts the most. Not paying a fine is a crime in itself. One of the most terrible punishments doled out by the colonial government is to declare the criminal an outlaw, marking him as such with a brand. This means the person is outside the law, which now offers the individual no protection. The criminal can be killed, maimed, robbed, and cheated at will by anyone in Aradie with no legal repercussions. Most outlaws flee the colony immediately, hoping to escape before some opportunist does them in. Some outlaws head out to the Lakelands and live among the native tribes. Others resettle in the colonies of the other nations. Most end up dead. Generally speaking, the colonial government in Aradie prefers not to incarcerate people because of the expense in building and maintaining prisons, feeding prisoners, and paying guards to watch prisoners. The prison in Sherbourg is primarily a temporary hold for accused awaiting their trial or those spending the night while their days are in the stocks and pillory. The stocks and pillory are two forms of punishment through public humiliation. The stocks are a pair of boards that lock the criminal's feet in place, while the pillory locks the criminal's head and hands in place. Because of the awkward angle and inability to move, the pillory is far worse than the stocks. Passers-by are encouraged to throw mud, rotten fruit and vegetables, and even excrement, making it a nasty, dirty, and smelly experience for the imprisoned. Since this punishment is not supposed to be lethal, time in the pillory is limited to two hours a day and eight hours a day in the stocks. Particularly egregious crimes may earn multiple days in the stocks and pillory.